Since the introduction of steelhead into the Northeast in the late 19th century, the Great Lakes and their tributaries have become the home to some of the best steelhead fishing in the world. The serene environment of the beautiful rivers and creeks create a sharp contrast to the adrenaline infused action of fighting a gorgeous two to three foot chrome goddess. The abundance of small and large creeks also provides fishable water under most weather and water conditions. 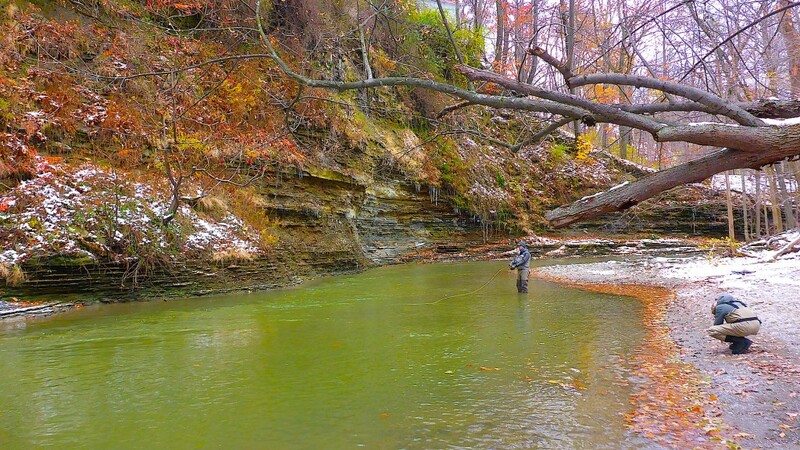 While there are steelhead to be found throughout most of the year, the peak season in the fall is generally from mid October to mid November on the Cattaraugus and some smaller streams. 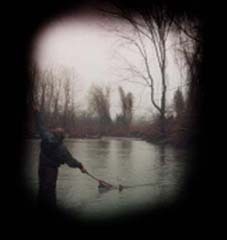 Mid November through late December is generally best for all the smaller streams. The Cat is often blown out during this part of this season. The spring run usually peaks in mid March through mid April in the smaller streams and peaks a bit later on the Cat as the water begins to subside. Whether you are a beginner or an expert, you will find that your guide will accommodate your needs and choose locations appropriate to your skill level. Alberto recognizes the importance of solitude in the fly fishing process and he specializes in finding unpressured water. In addition to your world class fly fishing opportunities, your full day guide trips will include a homemade lunch which is prepared by Alberto’s wife, Janeil, and is served back at his 19th century brick farmhouse which is minutes away from several streams. Your New York State licensed guide, Alberto Rey, is not only an accomplished fisherman but is also an nationally recognized artist. His work is in the permanent collections of over a dozen museums and is a contributor to Gray’s Sporting Journal, Fish and Fly magazine, The Art of Angling Journal, American Angler, Fish and Fly magazine and other magazines. A special tour of his studio can be scheduled during your stay and a watercolor or oil painting of your trophy steelhead or favorite stretch of water can also be commissioned. This is a perfect way to remember the day’s events. All equipment, flies, instruction and custom enhanced images from the trip are provided as part of your guide fees. Gratuity is optional and is not included in the price. Additional private casting or fly tying lessons are also available. Oftentimes the best gift is a fond memory. Let us try create a life-long memory for you and your guests.